Our superhero theme continues this week. We have been describing superheroes and writing our own superhero stories. We have also been designing our own superhero badges! As Sports Day is in the first week after half term (weather permitting), we have been practising our races on the field so that we all know what we need to do and which colour team we are in. 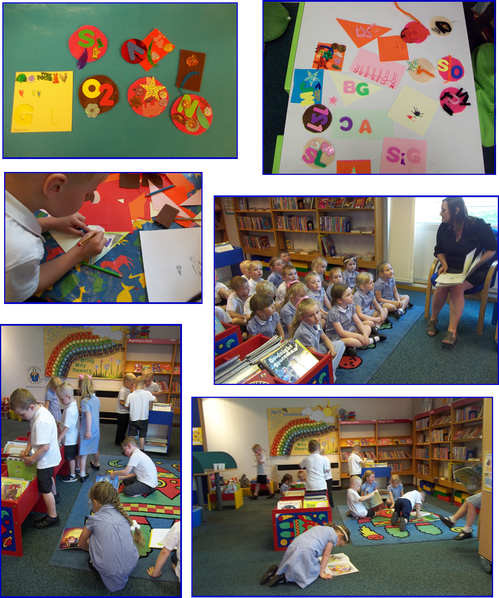 On Thursday, the Zebras thoroughly enjoyed their visit to the library. We listened to stories read to us; sang songs and played instruments, but our favourite song was 5 little monkeys jumping on the bed! Of course, we love choosing new books and sharing them with our friends and family. We love our library! A big “Congratulations” to Darcie-Rae and Nicola for achieving their Level 8 Proficiency Gymnastics certificate and badge. Super Gymnasts - we are very proud of you!